Thornton Steward Reservoir is a little-known picturesque spot tucked away in a quiet corner of the countryside of Bedale, near Masham, in the Yorkshire Dales. Owned by Yorkshire Water, there is a small car park with free car parking and a concrete path around the reservoir which makes for a pleasant waterside walk of about 1 mile or so. From the reservoir there are lovely views of the surrounding countryside and it is very tranquil. Thornton Steward Reservoir makes for a lovely spot for a picnic and short walk on a sunny day. 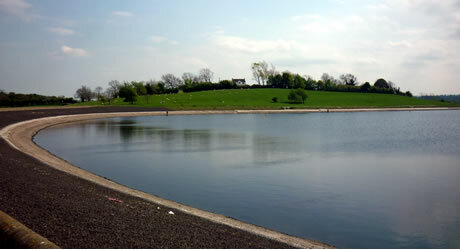 The reservoir is used recreationally for fly-fishing and sailing. We visited on a bank holiday and encountered just a couple of fishermen. A visit here could easily be combined with a visit to the nearby market town of Masham or a trip to Middleham Castle as well as dropping by at the nearby Brymor Farm to sample their delicious ice-cream. This entry was posted on Saturday May 7th, 2011 at 8:30 PM and is filed under Places to Visit, Places to Walk.You can follow any responses to this entry through the RSS 2.0 feed. You can leave a response. Good walk and some nice sites such as Snape Castle but why go to the qurray ponds when the real Nosterfield Nature Reserve is just one mile south an ex qurray but truly full of amazing wildlife.